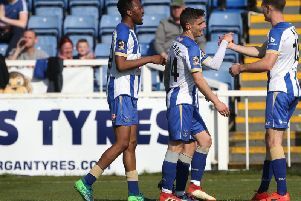 Hartlepool United have been tracking the Newcastle striker. Newcastle United U23s coach Ben Dawson has admitted the club need to assess Elias Sorensen’s situation ahead of a potential loan move to a Football League club. The 19-year-old scored yet again to make it 18 goals this campaign as the Magpies youngsters progressed into the third round of the Checkatrade Trophy on penalties last night. Sorensen fired the opener in the 24th-minute, although endured a fairly uneventful evening in front of goal after squandering the chance to grab his second soon after the break. After Scott Wilson equalised for Sol Campbell’s Macclesfield Town, five minutes from time, Sorensen watched Mo Sangare dispatch the winning spot-kick after being subbed for him in the 78th minute. “I think there is still some logical steps that we need to take. He is generating a lot of interest here and from other clubs,” said Dawson. “I’d imagine we need to have a sit-down and discussions with the manager, Steve Nickson, our staff around what we think the best step is. National League side Hartlepool United have been linked with a move for Sorensen, however Dawson wants the Dane’s next move to be talked about at length. “It depends on the interest, we’ll see what comes in – Steve and his team will gather information and then we’ll have a chat about what the options are, then make that decision. “Because he is still in that development stage, we want them to be able to work on certain aspects of the game. “You look at Sean’s (Longstaff) loan last year at Blackpool, it was key for us.